It certainly wasn’t the finish anyone expected for the 2005 Yukon River Quest, but when it was all over on Sunday, only two previous Yukon River Quest records stood, with new standards set in eight categories, including the overall course time. In what will surely be called a banner year for the annual 740-kilometre (460-mile) journey, the winning teams posted a time of just 42 hours and 51 minutes. And for the first time in the race’s history, there were two winners, as Yukoners Stephen Mooney and Greg McHale joined paddles with Americans Chris Swan and Sean Brennan, crossing the finish line in Dawson City together in their tandem kayaks. “I don’t think either one of us could have won without the other,” explained an exhausted Brennan after finishing the race. McHale and Mooney were quick to agree, pointing out the two teams raced side by side for pretty much the entire race. Besides, said Mooney, the tie was a good decision for the Yukoners, considering the competition they were up against. What nobody besides the American duo knew at the start was just how much paddling experience Swan and Brennan brought to the table, something they purposely kept under wraps. In fact, the two men recently won the world dragon boat races, something which wasn’t lost on Mooney and McHale, who only found out about their competition’s background while in conversation on the river. But the partnership certainly wasn’t one-sided, as both teams admitted. Brennan and Swan may have had the edge in speed and experience, but Mooney and McHale had something even more important for this race – knowledge of the Yukon river. “We got through Lake Laberge and had about three kilometres on everybody,” said Brennan. “Flat water is our specialty. But then we took the wrong channel on the river and we all of the sudden – in one hour – found ourselves down by about two kilometres. We realized right then we were out of our league on this river. In fact, before they met Mooney and McHale, the American team was planning on sticking with defending champion Steve Landick and his partner Fred Mynar, who were the favorites to win the race once. They were going to follow Landick until the final 500 metres and then “blow his doors off” in a sprint to the finish. But Landick and Mynar fell off the pace after Carmacks – they were two minutes out of the lead heading into the seven-hour layover and ended up twenty minutes behind at the finish – and Mooney and McHale entered the picture. Brennan and Swan kept their sprint strategy in mind, lightening the load in their kayak for the second half of the race, but they became quick friends with the Yukon duo, and both teams leaned on each other’s strengths, which is what helped them put Landick so far behind. While Mooney has competed in the River Quest before – placing third overall as a solo kayaker in 2004 – McHale, Brennan and Swan were all rookies of the event. Brennan originally found out about the River Quest from a website years ago, when he was sprint paddling. “I have the paddling background and I also love marathon stuff (he’s competed in numerous marathons in the U.S.), so this was just fascinating to me,” he said. “Chris is my training partner back home, so I mentioned it to him and he said, ‘Yeah, I’ll do that. For McHale, it just seemed like a natural progression. The RCMP officer, who currently resides in Dawson but is planning a move to Whitehorse, has been taking part in adventure races for years – he and his wife Denise won the Fulda Challenge in the winter of 2004. He went into the River Quest fully prepared for a “sufferfest,” but said there wasn’t as much suffering as he had expected. “Compared to adventure racing, my body’s going to probably bounce back a lot quicker,” he said. “But nonetheless, it’s a tough, tough race. At least in adventure racing, you can switch things up, but this is just straight paddling. Mooney said he’ll probably be back next year, although he’s thinking about doing it coed with his girlfriend, and wants the McHales to join in as well. As for Brennan and Swan, once is probably plenty good enough. McHale said racing with such great competitors as Brennan and Swan made the River Quest an even greater experience. Their decision to come across the line together seemed to create a domino effect among the other racers, with four place finishers Changelife.com – a mixed tandem kayak – and solo kayaker David Kelly crossing the finish in a time of 45:22. Those two squads had also travelled together for pretty much the entire race. On Saturday afternoon, Skagway’s Brady Bunch – comprised of Jeff Brady and his 15-year-old daughter Annie Dawson Brady – joined up with Dave Sevdy down the final stretch. The time posted by Changelife.com – Californians Heather and Brandon Nelson – was a new record in the mixed tandem kayak division, another of the eight records set this past weekend. Landick and Mynar broke the record for tandem canoe, posting a time of 43:10. The men’s solo kayak record fell as well, with Kelly’s time of 45:22 eclipsing the previous time of 47:48, set by Mooney last year. The women’s tandem kayak record was smashed by Americans Amy Byers and Denise Kimball, who finished with a time of 59:31. Byers and Kimball also held the previous record of 67:04, posted last year. In the women’s tandem canoe category, it was Tunde Fulop and Danielle Boisvert – A.K.A. Power Buns – passing last year’s record of 57:22, with their time of 55:18. And in the voyageur canoe class, the RCMP squad Scarlet Fever set a new record with their time of 55:50, which was more than six hours faster than their time last year. The only two records that did not fall in the 2005 River Quest were in the mixed tandem canoe and women’s solo kayak categories. The record for the mixed tandem canoe class remains at 47:02 while the record for women’s solo stands at 56:46. 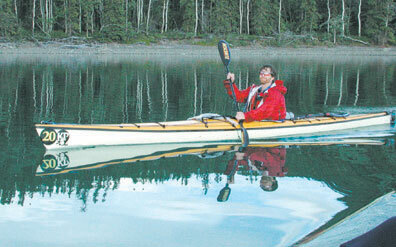 To see more pictures of the 2005 Yukon River Quest, check out the centre spread in Wednesday’s edition of the Star.